474 pages | 98 B/W Illus. 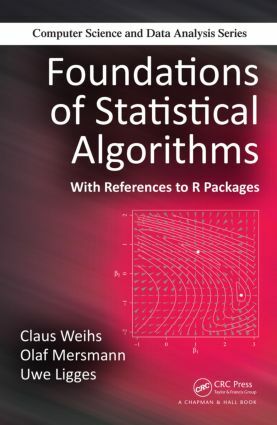 A new and refreshingly different approach to presenting the foundations of statistical algorithms, Foundations of Statistical Algorithms: With References to R Packages reviews the historical development of basic algorithms to illuminate the evolution of today’s more powerful statistical algorithms. It emphasizes recurring themes in all statistical algorithms, including computation, assessment and verification, iteration, intuition, randomness, repetition and parallelization, and scalability. Unique in scope, the book reviews the upcoming challenge of scaling many of the established techniques to very large data sets and delves into systematic verification by demonstrating how to derive general classes of worst case inputs and emphasizing the importance of testing over a large number of different inputs. Broadly accessible, the book offers examples, exercises, and selected solutions in each chapter as well as access to a supplementary website. After working through the material covered in the book, readers should not only understand current algorithms but also gain a deeper understanding of how algorithms are constructed, how to evaluate new algorithms, which recurring principles are used to tackle some of the tough problems statistical programmers face, and how to take an idea for a new method and turn it into something practically useful. "… it provides the necessary skills to construct statistical algorithms and hence to contribute to statistical computing. And I wish I had the luxury to teach from Foundations of Statistical Algorithms to my graduate students … a rich book that should benefit a specific niche of statistical graduates and would-be-statisticians, namely those ready to engage into serious statistical programming. It should provide them with the necessary background, out of which they should develop their own tools." "The book is suitable for readers who not only want to understand current statistical algorithms, but also gain a deeper understanding of how the algorithms are constructed and how they operate. It is addressed first and foremost to students and lecturers teaching the foundations of statistical algorithms." Models for Computing: What Can a Computer Compute? Floating-Point Computations: How Does a Computer Compute? Precision of Computations: How Exact Does a Computer Compute? Conclusion and Exercises appear at the end of each chapter.